he subsequently wrote a letter thanking all the parties and I would like to share that with you today. I think this personifies the Baudette area and our northern Minnesota hospitality. 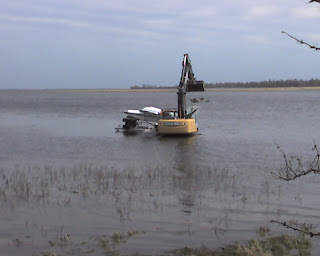 A note of thanks to all the good folks in the Baudette, Rainy River area who came to my rescue after my flat plane flipped over on the Rainy River May 14th. Mike Sullivan and his fishing partner picked me up in their boat as I was exiting the upside down airplane. The Wigwam Resort under the direction of Tom Briggs got me dry clothes; let me use their phone for hours and a vehicle to get to town for new clothes and everything else I needed. Stuart Noble at Noble Drug for getting me some prescription medicine I needed. Tom Griffen orchestrated the whole salvage operation spending two long days getting the plane back upright and to the Baudette airport. Eric Bendickson spent 16 hrs trying to get the plane upright but didnt quite have the horse power. Lake of the Woods County Highway Dept. came to the rescue. Lee Hancock with the approval of Jeff Pelland spent all day Thursday on the barge and then offered to get their excavator to an access to get my plane upright on the floats. 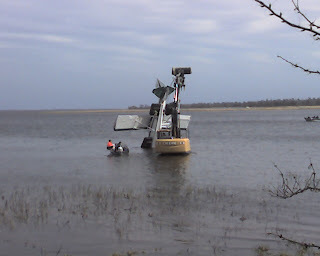 Lees skill with the excavator got my plane upright on the floats with minimal damage. John Craig, Gary Noble, Bob Sindler and big time help from Emory Vaagen of Bear Aviation. mainly sunny with a high of 66F with winds W at 10 to 15 mph. Tomorrow evening will be partly cloudy skies with a low 48F with winds SW at 5 to 10 mph. I have been told that as of this morning the wind was to gusty, even for the big launches to go out on the big water, but I hope this evening and tomorrow will bring us some calmer winds, so we can get out to the bigger fish about ¾ or a mile out from Lighthouse Gap in the mud fishing at the depth of 32 feet. When you get the chance to get out that way you will want to be fishing with Pink & White jigs with frozen shiners. The fishing has been phenomenal. Lighthouse Gap is still producing in about 14 to 18 feet of water. Ive been having great success casting out into the current and jigging back to the boat against the current with my trusty Pink jig with a frozen shiner. Once again, make sure youre on the bottom, because thats where the fish are at! Good Luck and Happy Fishing! My shout out today will go out to Paul Schroeder. Paul was our guest that didnt get to do much fishing with us during his stay, because of the float plane accident, but I hope to see him back very soon and I wanted to thank him for his kind words about our great community. Paul was part of the Jim Pittenger Group that visited us from the Omaha and Lincoln Nebraska areas. I have been told they are all planning to visit us again in August. I hope to see them all at that time.